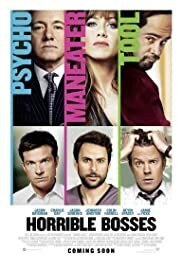 BEFORE: I don’t have any interesting opening line here so I’ll just begin by saying that today’s film is Horrible Bosses. It stars marathon newcomers Jason Bateman and Charlie Day in addition to some veterans like Kevin Spacey (last seen in Margin Call) and Colin Farrell (last seen in Seven Psychopaths). AFTER: Horrible Bosses is a great comedy that is marred by a plot so unrealistic that the humor borders on absurdity. Let’s start with the good. Nick Hendricks (Jason Bateman) and Kurt Buckman (Jason Sudeikis) are two very funny characters and lead the way in terms of the employee humor. Lots of physical humor but there were also many witty lines and great expressions (especially coming from Bateman with his trademark stare). On the boss side of the spectrum, David Harken (Kevin Spacey) is the clear winner in terms of laughs with a commendable effort given by Bobby Pellitt (Colin Farrell). The thing to know about the comedy in this film is it relies heavily on your connection with the characters. The jokes aren’t funny in-and-of-themselves; if they’re said out of context or by someone else the jokes won’t be funny. However, if you can connect with the characters, you’re in for some hilarity. Now onto the not-so-good. What do I mean when I say unrealistic? It’s not that it’s not feasible in reality, but that the film depends on coincidental actions to reach the end result. There’s a deus ex machina every five minutes it seems at the end so that everything works out squeaky clean with no loose ends or plot holes. While everything that happens is theoretically possible (except for the police officer’s handling of the situation at the end - that would never happen) there is no way something like this could happen in real life.